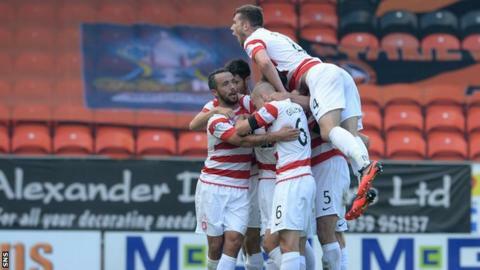 Hamilton's Tony Andreu (hidden) celebrates his goal against Dundee United. Hamilton boss Alex Neil praised the character of his team as they battled to a 2-2 draw with Dundee United to top the Scottish Premiership table. Both sides had a man sent off, with Darian McKinnon seeing red, followed by United counterpart Nadir Ciftci. Mickael Antoine-Curier and Anthony Andreu put Hamilton ahead and Neil felt they should have got more than a point. "To have the bottle and come back and score a couple of goals, that's the one thing we've got in our team," he said. "Getting the result was the main thing. We came here to try and get something and, to be honest, over the piece, I feel a wee bit hard done-by that we never got more than we got. "I thought we were in control up until they scored. "We came back into it and showed real character. Over the piece, coming away from home, it was a really good performance and a bit unfortunate we didn't get the win." Newly promoted Accies now top the table on goal difference after Inverness Caledonian Thistle lost away to Partick Thistle, but Neil was more pleased with how his side performed at Tannadice. "We always look at the performance first because we feel if we play well enough then the results will come," he told BBC Scotland. "Performance-wise was excellent, really pleasing, particularly after going down to 10 men and a goal behind. "We're a good goal threat going forward, so I was delighted with the players. "We're playing well enough. We just need to focus on our performance and continue that as the season develops. "Our goals are high and we'll see how we do."